More art on TV! Channel 4 has another Grayson Perry series and this time it's all about men! Grayson Perry has had a project of one sort or the other with either Channel 4 or the BBC every year going back to 2012 (see details at the end - plus links to my blog posts about the same). It's now officially time to start guessing what the next one might be - it's probably happening right now! The latest series is called Grayson Perry - All Man and it's recommended viewing for all artists interested in art created out of exploring themes of importance within our society. The series has three episodes. Episode 1 – HARD MAN – sees Grayson spend time with a group of cage fighters in the North East. As a self-described ‘lifelong sissy’, Grayson thinks the desire to be tough is holding modern men back. But as he explores the vulnerabilities that lie behind the fighters’ public personas, takes part in the Durham miners’ gala and meets the friends and family left behind in the wake of one young man’s suicide, what he uncovers reverses his expectations. Grayson was back investigating different groups of people. What I always find amazing is how he (a) manages to find them and (b) how they all seem to like him and (c) why they tell him all sorts of things about their lives. Maybe because his natural manner is so disarming? How could anyone not like Grayson? What was also very touching was the way he revealed more about himself during the course of the programme. I do value an artist who creates art based on research and investigation of a subject but at the same time grounds it in his own emotions and values. The Death of a Working Hero - as seen in "Grayson Perry - All Man"
I do hope we'll get to see them at some point in the future. 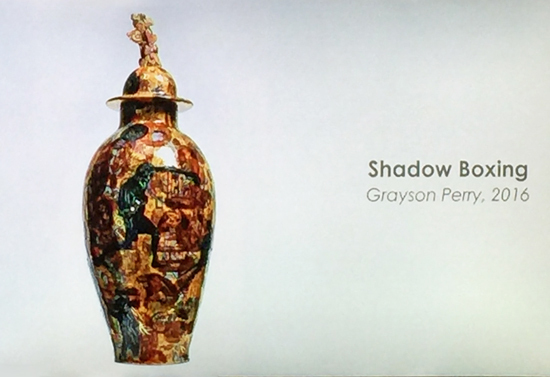 Shadow Boxing - as seen in "Grayson Perry - All Man"
- as seen in "Grayson Perry - All Man"
I must confess I found it fascinating to watch him making the artwork for his tapestry direct on the huge (Wacom?) 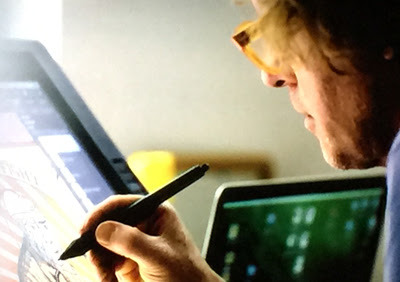 tablet with a digital stylus. He's a very fine draughtsman who has found a way of making his style work through digital software and into weaving! 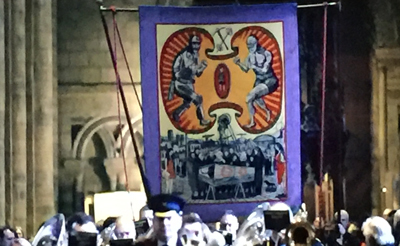 When I say tapestry it is of course a tapestry reincarnated as a Miner's Gala Banner. Which was then processed through (I think) Durham Cathedral at the end of the programme where it is revealed to those who participated in the programme and whose images features in the two works he produced. "The Death of a Working Hero" being processed as a Banner- as seen in "Grayson Perry - All Man"
Episode 2 – TOP MAN – Grayson goes to Skelmersdale, Lancashire to meet two groups of men concerned with rank and territory: the police and the drug dealers they regularly arrest – as well as the local residents who live with this turf war. More than 80% of the crime and anti-social behaviour in the UK is caused by men, but the issue is rarely addressed in gender terms. As Grayson joins officers on a raid, and walks the boundary of the estate with some of the young men who live there, he finds universal male preoccupations bound up in this very local conflict. Episode 3 – RATIONAL MAN – finds Grayson among traders and hedge-fund managers in the City of London. The modern City, they tell him, is all about calm, cool rationality, but Grayson suspects that in the long journey from hunting mammoths to clicking mice, impulsive aggression and raw passion haven’t disappeared quite so easily. A tense final exhibition sees the financial powerbrokers come face to face with the work that Grayson has created. What is it like to be a man in the modern world? The Telegraph: Grayson Perry: All Man - review: who better to talk about modern manhood? his first Channel 4 series was All In the Best Possible Taste (2012) won a BAFTA for his exploration taste and class. This resulted in his series of six tapestries titled The Vanity of Small Differences which were shown at the RA Summer Exhibition in 2013. Perry and his gallery gifted this major work to the Arts Council Collection and the British Council and they have subsequently toured the country. The next series was Grayson Perry: Who Are You? in 2014 - which resulted in an exhibition at the National Portrait Gallery. Than you so much for this post and for gathering together these links. I have long admired Grayson Perry for his work and more recently his very clear and thought provoking TV and radio programmes. He is not an easy person to describe to someone who hasn't heard of him. This post helps! 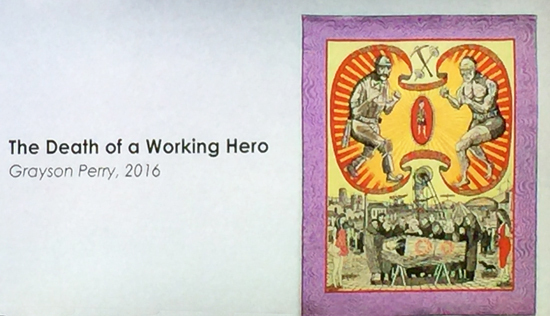 Great source of information here on the inspiring Grayson Perry, thank you.